"The heroes had crosses over their heads, the ones that are buried in the cemeteries. Those are the true heroes, not us. We're just part of the works, that's all. And we thank God we got back alive." Other Stars: Kirk Acevdeo, Eion Bailey, Michael Cudlitz, Dale Dye, Rick Gomez, Scott Grimes, Colin Hanks, Frank John Hughes, James Madio, Neal McDonough, David Schwimmer, Matthew Settle, Douglas Spain, Richard Speight, Jr.
After collaborating on the World War II masterpiece, Saving Private Ryan, Tom Hanks and Steven Spielberg realized that there was a much larger story to be told, one that even the longest theatrical film could not embody. 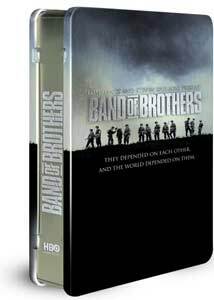 Together, they executive produced HBO's Band of Brothers, a 10-part World War II miniseries based on Steven Ambrose's novel of the same title. With a budget of over $120 million, Band of Brothers is the most costly and ambitious television project ever created. The result is a story of epic proportions and one of the most revealing World War II dramatizations I have seen to date. Band of Brothers avoids futile attempts to show an all-encompassing account of World War II, and instead, tells the true story of one unit in the United States Army�Easy Company, 506th Regiment, 101st Airborne Division. Nearly four years of Easy Company's travels are documented, from their formation and training in the United States to their participation in major events such as the Normandy D-Day invasion, Operation Market Garden, the Battle of the Bulge, and the seize of Hitler's Eagle's Nest at Berchtesgaden. The distinct focus on Easy Company allows viewers to follow the progression of the war, from D-Day to V-E Day, while remaining rooted in the personal lives of these men. Many episodes are told from a different soldier's viewpoint, each offering his own perspective on the emotional and physical strain of war. The realism of the series is heightened as each episode begins with telling interviews from the real-life survivors of Easy Company. Their remembrances of these events enhance the emotional aspect and help to dismiss any sense of disbelief for moments that might otherwise seem farfetched. Few compromises have been made in faithfully adapting Ambrose's novel, which provides a stunningly honest depiction of the company that sustained one of the highest casualty rates in the war. While the screen version occasionally resorts to unnecessary melodrama, it also offers startling visual elements that do not always come across as effectively on the written page. Most noteworthy are the magnificent yet horrific battle sequences. Few war films have portrayed combat as effectively as Band of Brothers. The use of hand-held cameras and enveloping surround sound create a chaotic sensory experience that draws the viewer directly into the heart of the action. Some of many memorable scenes are the attack on a German artillery garrison near Utah Beach on D-Day, the gut-wrenching bloodbath at Carentan, and the utterly breathtaking Normandy parachute drop. The intensity of the series is not merely limited to battle sequences, however. The moment where Easy Company discovers the horrific remains of a Nazi concentration camp proves as emotionally pulverizing as any of the bloody battles. So effective is the cinematography that I even found myself shivering during episodes that took place in the snow covered Ardennes forest near Bastogne, Belgium. Through these carefully constructed visuals and expertly written episodes, we are not only made to understand the encounters of Easy Company, we are given the opportunity to experience them. In a noble attempt to honor the real men of Easy Company, Band of Brothers features over 60 soldiers, their names unaltered from those who served in the company. One could foresee the inclusion of innumerable characters as a great weakness, making it difficult to feel empathy towards any of them. Had there been a more direct focus on a select few leading actors, the series might be easier to follow, but it would also disrespect the true story of Easy Company. Watching Band of Brothers, particularly for the second time, I was amazed by how well the series keeps track of each character. Though many drift in and out of the main story line, each soldier is given enough screen time to allow the audience an understanding of exactly who they are. While there are several in the company who stand out amongst the ranks, no one man is more important than any other, and I personally felt emotionally attached to each of them. Yes, it is occasionally difficult to discern who is who, but I admire the decision to credit the entire squad that fought so valiantly for freedom. Unlike the television broadcast, the DVD includes a fantastic Field Guide, which offers profiles of the key soldiers in each episode. This unique special feature allows viewers to familiarize themselves with the large cast and eliminate much of the confusion. The closing credits of each episode end with the words "This film is a true story. Certain characters & events have been altered for dramatic purposes." While Saving Private Ryan features a riveting reenactment of the landing at Omaha Beach, the rest of the film is somewhat hampered by a purely fictional story. Where Band of Brothers excels is in showing the actual events of World War II as experienced by Easy Company. Though obviously only a recreation, knowing that these events are modeled after real occurrences significantly heightens the impact of the series. However, while based entirely around true events, I will not go so far as to say that Band of Brothers is reality. Created in the Hollywood system, its sole purpose is to provide entertainment value, and one must remember that this is merely a piece of fiction created from non-fictional events. Nevertheless, this fictional entertainment combines with stunning realism to provide a compelling, yet sobering experience. As I was sitting on my comfortable couch, allowing myself to be entertained, I was humbly stricken by how much these men sacrificed to fight for the freedom that so many of us often take for granted. Honest, heartfelt, historical, and horrific, Band of Brothers is a masterful hybrid of both entertainment and education. Easy Company begin their rigorous paratrooper training in Toccoa, Georgia under the harsh command of Lieutenant Sobel (David Schwimmer). The men despise Sobel, while junior officer Richard Winters (Damien Lewis) earns their respect. After a grueling basic training at Camp Toccoa, Easy Company ships out to Aldbourne, England for more training in preparation of the D-Day invasion of Europe. Currahee effectively develops the brotherhood between the men of Easy Company, a bond that will soon follow them into heavy combat. The episode ends with a stunning shot as a sky full of C-47s soars above the naval fleet, all en route to what will be the largest invasion in history. Day of Days picks up right where Currahee left off on June 6th, 1944�D-Day. The allied planes carrying thousands of paratroopers meet with heavy German artillery fire as they cross the English Channel to Normandy, France. Many paratroopers are killed before they reach the ground, while those who do land safely discover that they have missed their drop zone and have lost their weapons and supplies due to the chaotic jump. Richard Winters, armed with only his bayonette knife, eventually links up with several Easy Company soldiers who have been scattered randomly across Normandy. Arriving at a temporary command center, Winters is chosen to lead a mission to destroy a German garrison of four artillery guns firing on the troops landing at Utah Beach. The mission is a success, saving the lives of innumerable troops at Utah Beach, though Winters loses a man under his command and several others are wounded. The intensity has begun in Day of Days, an exhilarating episode with tour-de-force combat segments. Easy Company is sent to take the small town of Carentan, which is essential in linking the Utah and Omaha beaches into a strong allied beachhead. Easy Company engages in a successful battle, but their efforts result in several casualties. After seizing Carentan, Easy Company must prepare for the impending German counter-offensive sent to take back the town. Carentanfocuses predominately around Private Albert Blithe (Marc Warren), a timid soldier having difficulty adjusting to the horrors of combat. It is a powerful episode with spectacular, albeit startling battle sequences. Carentan is not for the squeamish. After a brief rest in Aldbourne, England, Easy Company, along with a group of new paratrooper replacements, receives orders to participate in Operation Market Garden on September 17, 1944. This massive drop into German occupied Holland is part of an effort to end the war by Christmas. The Dutch townspeople of Eindhoven greet Easy Company with the utmost respect for liberating Holland, which has been under Hitler's regime for four years. Though the airborne drop is a success, German forces pulverize Easy Company and a group of British tanks in their attempt to capture a nearby town, resulting in many casualties before a mass retreat. Operation Market Garden and the effort to end the war before Christmas is deemed a failure. A powerful episode, Replacements is an intense focus on the hardships of joining an existing company as a new recruit. Winters leads a successful mission on a Dutch dike, resulting in his promotion to battalion executive officer. Dissatisfied with his new job, Winters takes a 48-hour weekend pass to Paris for relaxation, but is haunted by the combat memories in Holland, particularly the instance when he gunned down a young and defenseless German soldier. Winters and Easy Company soon receive word that a massive German offensive has begun in the Ardennes forest outside of Bastogne, Belgium, severing the allied lines. Easy Company marches in to hold the line, though they are completely unprepared for the freezing cold and full-scale assault that will soon be upon them. Lacking adequate food, ammunition, and winter clothes, Easy Company moves into Bastogne for what will be their most horrific experience yet. Told in flashback narrative, Crossroads brings a welcome and unique quality to the series' middle episode. The men of Easy Company spend Christmas of 1944 in Bastogne, pummeled by countless German artillery shelling while braving frostbite and starvation. Bastogne is the perfect episode to focus on Eugene Roe (Shane Taylor), the company medic who is overwhelmed with what I believe to be the most demanding yet thankless position of the company. Easy Company moves to the Bois Jacques, the woods north of Bastogne. Entrenched outside the small German held town of Foy, Easy Company must endure more intense artillery attacks before making their assault on the town. Told from the viewpoint of C. Carwood Lipton (Donnie Wahlberg), The Breaking Point is a powerful episode revealing the wounding, mental breakdown, and the deaths of many major characters. After the nightmares of Bastogne, Easy Company moves to the Alsacian town of Haguenau near the German border. Lieutenant Henry Jones (Colin Hanks), a young replacement fresh from West Point, eagerly volunteers to lead a squad on a patrol mission across the river to capture enemy prisoners. David Webster (Eion Bailey) also returns to Easy Company after being wounded in Holland, only to find himself an outsider amongst the other men for not enduring what they had in Bastogne. The brotherhood of Easy Company is strong in The Last Patrol, as indications arise that the war may be coming to an end. Easy Company soldiers into Germany with peculiarly little resistance from the German forces. While many of the men take a much needed rest, the company is soon confronted with the terror of the holocaust as a forest patrol discovers an abandoned Nazi concentration camp, still inhabited by haggard and decrepit prisoners. The aptly titled Why We Fight is an emotional powerhouse, proving nearly as strong as the visceral intensity found in Schindler's List. Easy Company enters Hitler's Eagle's Nest in the town of Berchestgaden, once home of the Third Reich. As the European war comes to an end, many of the men in Easy Company have to struggle with moving on to the Pacific to fight the war against Japan. Those lucky enough to return home are the ones who have earned enough "points" on their service record. Points is a pensive, often beautiful episode, and a captivating way to end Band of Brothers. Unlike the nine prior episodes, Points saves the interviews with real-life Easy Company veterans until the very end, at which point their names are revealed for the very first time. I cannot think of a classier, more honorable way to end this fascinating series. Image Transfer Review: Band of Brothers is presented in an anamorphically enhanced 1.78:1 aspect ratio, transferred directly from the original high definition masters. I was quite eager to see how well the 1080p source elements would hold up on DVD, and I am joyous to exclaim that the results are phenomenal. The entire picture conveys a smooth and glossy aesthetic that falls just short of a true high definition image. The level of detail is like none I have ever seen on the format. I was in awe as I watched tiny drops of rain fall on the actor's clothing and individual snow flakes float to the ground in Bastogne. Contrast is perfect throughout with deep spellbinding blacks and remarkable shadow detail. Much like Saving Private Ryan, colors are often muted and strong grain is occasionally evident, enhancing the gritty nature of the subject matter. Never at any point did I believe that this was not completely intentional. There are no distracting artifacts and no film blemishes to speak of during the entire 10-hour-plus presentation. Try as I might, I cannot find anything less than perfect about this transfer. I have always said that I would never honor a DVD transfer with an A+, being under the impression that no DVD is capable of providing such stunning visual attributes. I am thrilled to state that Band of Brothers has proved me wrong. This is the best live-action transfer I have seen to date. Audio Transfer Review: Both Dolby Digital 5.1 and DTS soundtracks are offered, and each fully satisfied my high expectations. Though fidelity is absolutely remarkable on both tracks, I have to give a slight edge to the DTS for overall tonality. While the mix is quite front heavy during the non-combative scenes, the surrounds occasionally provide subtle ambiance when necessary. Michael Kamen's magnificent score flows through the front soundstage with passion and vigor, though I detected little music presence in the rear channels. It might have been nice to hear more envelopment during these moments, yet I must admit that this mix sounds incredibly natural. The battle sequences are sonically assaulting, utilizing the capabilities of a 5.1 soundtrack to its fullest advantage. Bullets go whizzing by from all directions, while artillery shells shatter the foundation of the listening area courtesy of a powerful, albeit clean LFE channel. Amazingly, dialogue always remains crisp and clear even during moments of extreme war carnage. Most impressive is the dynamic nature of the soundtrack, which often extends from moments of total silence to the maximum peak of the dynamic range in the blink of an eye. There are several instances where I nearly suffered a heart attack from the drastic change in sound pressure level. Do not be persuaded into thinking that this soundtrack may be lacking simply because Band of Brothers is a made-for-television event. Quite the contrary, Band of Brothers is as sonically masterful as most major motion pictures, and far superior to many. Also available is a 2.0 surround mix, which pales in comparison to the 5.1. Extras Review: Based on the quantity of extras included, one might initially be baffled by my high grade for the special features. Honestly, if a DVD uses every smidgen of available space for special features, it does not necessarily mean that these features are worthwhile (a certain superhero DVD comes to mind). My grades are predominately based on quality over quantity, and I can think of few other releases that feature the level of superior extras as does Band of Brothers. Not only do the majority of these supplements provide insightful and educational entertainment, they also greatly enhance the impact of the main feature. So much so that I cannot imagine viewing Band of Brothers without their inclusion. First, I must give honorable mention to the packaging, which is the one of the finest DVD presentations I have seen. Everything is housed within a sturdy tin case, complete with embossed lettering on the front and spine. Inside, all 10 episodes and the special features are listed on the left side of the case, while the right side consists of a fold-out, Digipack style holder that carries all six discs and features gorgeous photographs from the series. This is very classy packaging indeed. Discs One through Five contain the 10 episodes, in addition to the inimitable Field Guide. This feature is all any viewer could ask for, as it both simplifies and intensifies the Band of Brothers viewing experience. Contained within the Field Guide are character profiles for the pivotal soldiers in each episode, an episode-specific map of Easy Company's progression, a glossary of frequently used terminology, and a key to how the chain of command works. Most interesting, however, is the historical timeline. This text-based section offers a fascinating look at the progression of events from the end of World War I to the end of World War II. I found this wealth of reading material to be an enlightening historical education. Moving on to Disc Six, we begin with the outstanding documentary We Stand Alone Together: The Men of Easy Company. 80 minutes worth of recent interviews with the real-life survivors of Easy Company are combined with rare and archival war photos and film footage. Hearing these men recount the experiences that we have just seen dramatized in Band of Brothers exemplifies the historical accuracy of the series and truly drives home its power. We Stand Alone Together should be considered the 11th episode of the series, as it is crucial viewing material in order to achieve the maximum potential that Band of Brothers has to offer. Behind the Scenes: The Making of Band of Brothers begins as a typical EPK-style waste of time, yet actually turns out to be quite interesting and informative. This 30-minute featurette takes us on a tour of the actor boot camp, the production and set design, as well as an appealing look at designing the computer-generated effects (which, I might add, are never overdone and always seamlessly integrated). This is an all-encompassing look at the making of Band of Brothers that reveals many fascinating secrets of the production, including some that I am not certain I wanted to know. The main downfall of this piece is the cheesy upbeat pop music, which could not seem more out of place. Otherwise, this is one of the better making-of featurettes I have seen. Ron Livingston's Video Diaries features raw camcorder footage that the actor filmed in preparation for his role as Lewis Nixon. Broken into twelve segments and running just under an hour, this candid footage focuses predominately on the tough boot camp that the main actors had to endure. Led by the infamous Captain Dale Dye, the actors go through a number of grueling physical exercises, as well as concentrated map reading and tactical training. This is a revealing, often humorous look at what these actors went through in order to deliver effective performances. I do not know how Livingston got around boot camp with this camera, but we can now all benefit from his efforts. The Premiere in Normandy is a brief look at the gathering of Easy Company veterans along with the Band of Brothers cast and crew at Utah Beach in Normandy, France on the anniversary of D-Day. In addition to a memorial service, Band of Brothers premieres on the big screen. Unfortunately, this is only a three-minute peek at the event, though it is still an meritable special feature. Next, is Who's Who: The Men of Easy Company. This feature is similar to the soldier profiles section of the Field Guide, only much more condensed. Thirteen characters are highlighted using short video clips from Band of Brothers. This is a helpful feature in keeping track of the many faces in the story. Also included are episode summaries for each of the 10 episodes, complete with accompanying photographs and promotional television spots. While I feel that the series works better without the photos and trailers, their inclusion is admirable. If desired, one can also watch a Jeep commercial and utilize a DVD-ROM section. I could not access the ROM feature, but I am told that it is simply a weblink. Band of Brothers is the ultimate DVD experience. My initial viewing of this series was limited to the analog HBO broadcast with a Pro-Logic soundtrack. While riveting, this experience still left much to be desired. Thanks to a pristine, high definition video master and a first rate DTS soundtrack, I now feel like I have experienced the series for the first time. Additionally, the ability to watch all 10 episodes in a brief period of time is a fully engrossing experience that did not translate as well in one-hour weekly viewings. Complete with a set of extras that intensify the power of the series and truly elegant packaging, this is one of the finest titles I have had the pleasure of reviewing. I give Band of Brothers my highest recommendation.